Working on the workplace | Damian Trasler's Secret Blog - Do Not Read! Libraries are an old idea (the library of Alexandria was constructed in the 3rd century BC and lasted until 30 BC), but there’s a reason they’re still around today. They provide access to knowledge, access to people that will help you find the way to ask the right question, collections of information that weren’t available in one place until the advent of the internet, and they have music and movies too. There’s also the crucial point that libraries provide free access to the internet for people who can’t afford their own computer or connection, or are away from home. They provide vital cultural information for new immigrants, and study materials for students of all ages. The library I work at has an eye on the future. Things change, and it’s never smart to continue doing things the old way just “because that’s the way it’s always been done”. 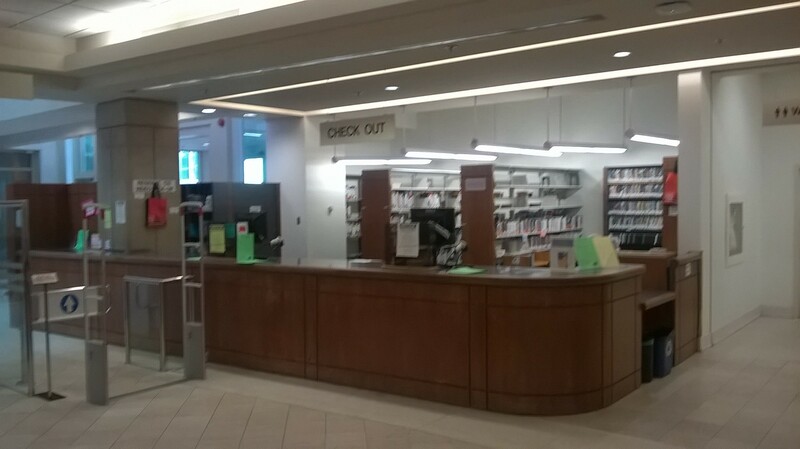 Over the next six weeks, we’re installing four new self-check out stations, allowing patrons to check out their own books. Why? Well, for one thing, that’s twice as many stations as currently exist, so lines will be cut down. There’s greater privacy for patrons too, since they don’t have to hand their books over to a clerk like me to check it out. We’ve improved the tagging system for better security and easier tracking. Some people won’t like it. You can’t please all the people all the time (hey, that’s catchy…) Some people will hate it forever, and some will come to love it. That’s fine. We’ll have more staff over on the other desk, the improved customer service area, and we’ll be happy to manually check out your books there if you would prefer that. This isn’t a dastardly scheme to make patrons miserable. In the meantime, I and my fellow workers are clearing back the library materials so that the contractors can get to work. We’re still pulling the books and dvds that you request by phone or online, and we’re still checking in the books that you drop off in the outside book drops or other branches. We’re still here, still working. 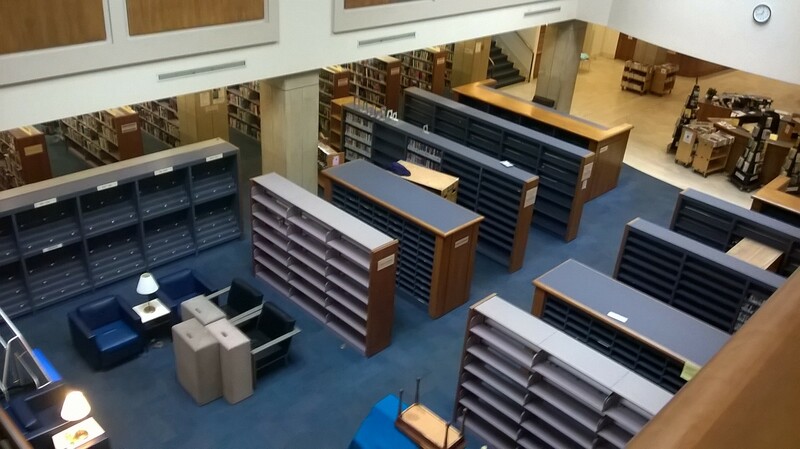 The DVD and CD shelves look ominously bare – because they’re going to be replaced with better ones that hold the full collection. So, in mid-January we should be cautiously open again – a reduced service while the finishing touches are put in place. We’ve only closed completely for two days, with access through the Programme Room for people to collect their holds or make renewals, or even check out the Speed Reads. We know it’s inconvenient, that many people love the library as a work space or study area, but this is an investment in the future. The library needs to stay relevant so that these peripheral benefits remain available into the future. This entry was posted in Uncategorized and tagged BPL, Canada, immigrant, learning, Library, library of Alexandria, Metrotown. Bookmark the permalink.